The Gold Angel is famous in all corners of the globe. Celebrated for its incredible success as one of the most prestigious gold coins in the world, the Gold Angel has been issued every year since its reintroduction in the 1983. 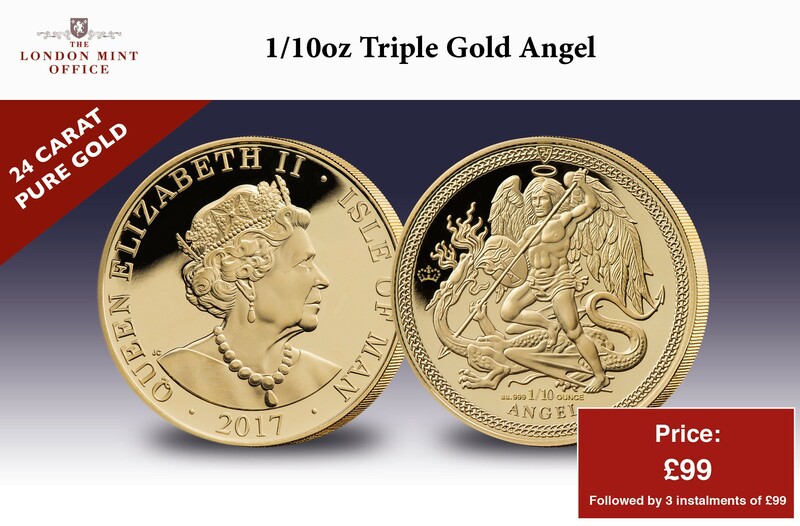 In 2017, to mark an incredible record-breaking year for Her Majesty The Queen, The London Mint Office has secured a limited number of Isle of Man Gold Angels, featuring a one-year exclusive Privy Mark. This 2017 Gold Angel coin has been released to celebrate the remarkable achievements accomplished this year by Her Majesty, and is struck in solid 24 Carat gold (.999 Au). With a mintage of only 2,499 pieces worldwide, this strictly limited issue features a stunning Royal Crown Privy Mark that will only ever appear on the 2017 Gold Angel. The Isle of Man introduced the Gold Angel in 1983, as a replacement for the Krugerrand, which many countries were prevented from buying or selling during the apartheid era. It became known as ‘the Krugerrand killer’, which makes the 2017 1/10 oz Gold Angel particularly significant, as we also commemorate the 50th anniversary of the Krugerrand in this year. When sanctions with South Africa were lifted, the two coins were able to co-exist, a testament to their iconic designs that have both independently stood the test of time. The 2017 issue of the Gold Angel celebrates The Queen’s magnificent milestone year, which saw her break no less than three records: In February she became the first British monarch to celebrate her Sapphire Jubilee (65 years as our Queen). Then, in November she and Prince Philip became the first British monarch and consort to celebrate their Platinum Wedding Anniversary, an incredible 70 years of marriage. Later that week, Her Majesty became the oldest current Head of State in the world. The coin features a unique Royal crown Privy Mark, applied at the time of minting that identifies this extraordinary Royal milestone issue. This means that this coin will become a ‘one year type’ - that is, a design that will appear once for one year only and then never again. Despite the high demand from collectors for the 2017 edition, this coin is highly affordable, and therefore sought after. Only 2,499 people in the world will get the opportunity to own this extraordinary coin.